Will Vee bring the apocalypse the Four Horsemen were sent to stop or is she here to prevent a world destroyed by chaos? The Four Horsemen are left reeling from their discovery that the world is threatened by something greater than anybody imagined. Now the group are forced into an uneasy alliance with old enemies. But can they be trusted? The group discover the shocking answer to who Vee is, why she's here, and her connection to Chaos is revealed. As the pieces join together and the Horsemen find out more about their identities, their place in the world becomes clearer too. How long do they have before Chaos becomes bored of his dangerous games and moves on to his final goal? Whoever brought Vee into the Four Horsemen's lives created a powerful bond that Chaos has failed to break. Now they need to prove that their love and strength is enough to change the future for themselves and the world. Descent is book six of The Four Horsemen reverse harem urban fantasy series. The other books must be read first. Have you discovered The Four Horsemen series? Don't miss out on reading this year's hottest reverse harem urban fantasy series. 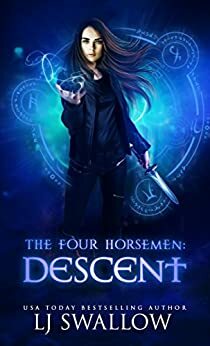 Prepare to follow the lives of Vee and the Four Horsemen through addictive books filled with action, paranormal suspense and magic. Start the series with Legacy and discover why readers have fallen in love with the books--and the Horsemen! The series contains strong language, steamy scenes, a kickass heroine and four guys who'll do anything for the girl who's the centre of their world. 4.0 out of 5 starsStrange Flow, Fantastic to Meh and Back Again. There are some really fantastic moments in Descent and some really meh moments. To be honest I did almost put it down a couple of times just because I couldn't keep going. There were brilliant moments, particularly with Joss. Joss has remained my fave Horseman, my fave character since the start and possessive Joss is not something we'd seen yet, it is super attractive. Seth is showing is colours more but even with the information we've got now I still can't figure out what is coming next. That unpredictability is interesting for me given that Reckoning is the last book and I'm generally fairly good at predicting the outcomes. But it is clearly all coming to a head, all the characters we have met along the way are coming back into play and bringing their strengths and weaknesses with them. This is actually becoming a series I would recommend to those other than just polyandry and reverse harem fans. There hasn't been anything that would be overly off-putting to general romance fans. It comes across as more of a paranormal series where there just happens to a woman with multiple romance options. And her relationships with the four men are drastically different. The inclusion of the Horsemen as a plot point, especially Joss' empathy could be very appealing to the paranormal romance set. But I can see Descent being the point in the series when I could see a lot of people stopping reading. Early sections are really indecisive as to tone and characterisation. I maintain the series that there is no way it needed to be 7 books, a duology, 3 maybe but making it a 7 book series makes it very difficult to stay involved, to keep reading. 5.0 out of 5 starsHighly captivating and emotional book!!! Like all the books in this series this is a great continuation of the story about Vee and her guys! In this book we see them get so much closer but this book is really building to the conclusion of this series! Not only do we have a book with action there is also so much emotion between them all. I can’t talk too much about the book as I don’t want to spoil it...but I love how Lisa as given Vee some girl time in this book and I can’t wait to see more of Syv in future books! I can’t wait for the next book and see how this story finished off and how Vee and her guys end up!! Ok now its final one more book of this series and its over, wow I was really panicking because I thought I will never see the pony boys and Vee again but LJ promised that they will be appearing in the upcoming new series of Syv oh yeah baby I can't wait for that too *grins* Descent is an intense prelude to the final reckoning and I feel sorry for Xander and Ewan their the two who can't deal with the prophesy regarding Truth and Chaos. And i can't wait for Joss to finally let loose. Heath on the other hand has so much in his shoulder. To hell in a handbasket, that's where all the best laid plans are going in this new installment of The Four Horsemen. The author adds more layers of intrigue, more unlikely alliances and a new addition who's breath reeks of brimstone. The character development in this book is superbly wrought, and my heart broke with theirs when they discovered what needed to be done. We know the players but this book is all about learning where the pieces stand on the gameboard. Our Horsemen have given themselves over to Vee completely, their love for her, their driving need to keep her safe is matched only by that same desire driving Vee. Chaos revealed himself and left our MCs reeling, now the race is on to shut him down before he is able to achieve his goal of destruction on a world ending level. Vee has finally learned to control the power she holds within, and we get glimpses of just how epic that power is throughout. A prophecy begins to take shape with the help of Syv and my personal fave the Collector. **Sidenote** .I love that they are more prominent this installment, both are so well written and interesting, really excited to read more about them.. The emerging prophecy does not bode well for our girl truth and this triggers all kinds of emotions we haven't experienced from Death, War, Famine and Pestilence..with the threat level high and Chaos throwing crazy fire weilding elementals and promises of world ending storms in their path, they really need to dig deep and draw strength from each other, we know of course though Seth won't make their path to happiness and a world saving conclusion and easy one. Good thing spot's on the prowl...who knew a hellhound could be such a handy thing to have hanging around. As always I finished the last page and wanted the next book immediately..so I'll just be here waiting for what's sure to be one heck of a finale. The characters are coming together in preparation for battle like chess pieces on a board. Lines are drawn, and those who were thought to be strong in their defence of the Portals are scattered like ashes to the four winds. Chaos might still be playing games, but they are getting more serious and even deadlier. However, Vee and the Four Horsemen still stand strong while Syv, The Collector, and the rest of the Alliance scrabble for clues and artefacts to unravel the secrets that have been hidden for so long. Texts are being translated and decoded until, a shocking truth to their reason for being is revealed, and it is one that could destroy them all in a way that Chaos never could. But, whoever created Death, War, Famine, Pestilence and Truth, also created Heath, Xander, Joss, Ewan and Vee – and the human emotional bond that binds them together. Could there be a flaw in the prophesy afterall? There are some huge developments in Descent, the sixth book in this series, and I have to admit to being gobsmacked on more than one occasion. LJ Swallow has created an entire civilisation throughout this series, and each character is a well rounded and necessary piece to the puzzle that Vee and the guys are trying to negotiate and piece together. I love it, and highly recommend it as a must-read to all aficionados of the Urban Fantasy genre. 5 Stars!